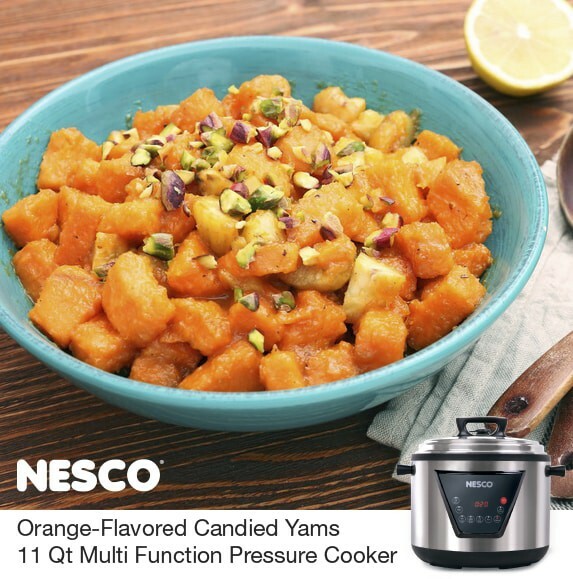 If you like yams you’ll love this recipe for Orange-Flavored Candied Yams made simple in your NESCO 11 Quart Pressure Cooker. Grated orange zest really adds to the overall orange flavor. Brown sugar adds just the right amount of sweetness everyone will love. Give this recipe a try and let us know what you think. Also let us know what are some or your favorite NESCO Pressure Cooker Recipes. Pour the orange juice into the NESCO® 6 Qt. 3-in-1 Digital Pressure Cooker. Peel the sweet potatoes and cut them in half lengthwise. Arrange in a steamer basket (if available) and sprinkle with salt, brown sugar and orange zest. Dot with butter. Lower the steamer basket into the pressure cooker. Lock the lid in place and turn regulator knob to SEAL. Program for HIGH pressure and cook for 8 to 10 minutes. When cooking is complete, use the Quick or Natural release method and open the lid. Lift out the sweet potatoes boil down the sauce until thickened and pour over the sweet potatoes.